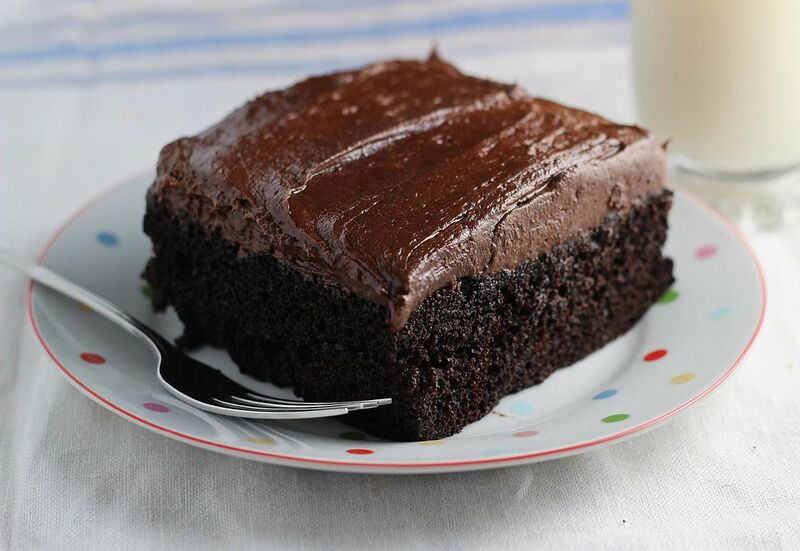 This is a one bowl cake, topped with a rich chocolate frosting. I think that the best chocolate cakes have a combination of chocolate and cocoa powder. The chocolate adds richness and moisture to the cake, and the cocoa adds a wonderful velvety consistency. Since the frosting is cooked, it is very creamy and smooth; the sugar dissolves into the hot butter and chocolate mixture. Make sure that you use unsweetened, or baking chocolate in this recipe; semisweet chocolate will be too sweet. Preheat oven to 350 F. Spray a 13" x 9" pan with a nonstick baking spray containing flour and set aside. In a large saucepan, melt 3 squares of the chocolate and 2/3 cup butter in the hot water and bring to a boil. Remove from the heat and add the flour, sugar, cocoa powder, salt, and baking soda. Mix well with a wire whisk or eggbeater. Stir in the buttermilk, eggs, and 2 teaspoons vanilla; beat until smooth. Pour into the prepared 13 x 9" pan. Bake at 350 F for 25-30 minutes, until the top springs back when touched with a fingertip. In a heavy saucepan, melt 2 squares of the chocolate and 1/3 cup butter together. Add the powdered sugar, milk, 2 teaspoons vanilla, and a pinch of salt and beat well. You may need to add more milk or powdered sugar to reach the desired consistency: the frosting should be just barely pourable. When the cake comes out of the oven, let cool for 15 minutes, then beat the frosting again and pour onto the cake. Spread the frosting, and let the cake cool. Cut into squares to serve.